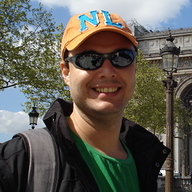 Gilberto Garcia Jr Scala, Clojure & Haskell developer I'm a developer with a passion to learn new things. Java, Scala, Haskell, and Clojure are some of the languages I know. Philosophy, music, literature, sports, and surfing are my hobbies. How to make docker and iptables to get along. How run IntelliJ using a different JRE. Preparing the backend for the free session page. Small and quick overview about the free session page. How to set inotify value to make IntelliJ happy. How to solve hibernate's 'No session currently bound to execution context' when using objects that are not managed by dropwizard. My quick check list on things I do to improve legacy code. Running backend and frontend tests upon every new commit pushed to github using Circle CI. How to run Jekyll locally in a docker container. Setting up a development environment or Arch Linux using Docker, Machine and Compose. Arch linux - Installing and configuring useful tools. Arch linux - Configuring Gnome and installing some base tools. Configuring Arch with Gnome, GDM and the necessary packages to configure the wifi network. How to install arch linux with UEFI, LVM, and an encrpyted HD. Creates the route to the free session page and refactor the home page. Build the first React component and show how to integrate it with the application. Use pureCss to build a nice and good looking home for the project. Set stack to use lts-4.1 instead of lts-3.20 and updating the project dependencies. How to setup your development environment to use Atom as your IDE. Now, we will learn how to set up webpack and how to integrate it with yesod. In this post we'll see how to create the skeleton for a new yesod project. Flora is a time tracker that I built to learn how to build a Haskell web application integrated with the React stack. How a book about techniques to write non-fiction turned out to be a great book on how to improve the code you write. Why methodologies fail software developers? Ideas behind the evolution of methodologies and its pros and cons. Software development, like any other craft, requires a set of skills. But, what skills?